Expect a warm welcome by your friendly host once you arrive at Malta Airport. Malta is an archipelago right in the centre of the Med and is just over 300km in land area. It has beautiful harbours and anchorages making this destination a firm favourite with people from all over the world. Malta is also one of Europe’s smallest countries with a population of approximately 413,609. Maltese is the spoken language along with English and the Euro is the currency used. Throughout its history, Malta has been strategically important with different powers ruling it. These include the Phoenicians, Romans, Fatimids, Sicilians, Knights of St John, the French and the British. Malta gained independence in 1964 from the UK and became a Republic in 1974. The island is known for world heritage sites like the Megalithic Temples, the oldest free-standing structures in Europe. The capital of Malta, Valletta, has fantastic shopping opportunities and a welcoming friendliness from the locals. After a restful night, it takes about one hour to reach Comino Island or you could drop anchor on the beaches of Gozo. This lovely island is different from the mainland in that it has different traditions, milestones, topography and happenings. These distinguish the island on a national scale and as a travel destination. With its low population and a slow process of urbanisation, the island moves at a very slow pace. Comino Island is just the place to relax. Once you return to your superyacht, retire to your cabin. The crew make an overnight sail to Siracusa, just 8.5 hours away. Siracusa or Syracuse is on the south-eastern corner of Sicily on the wonderful Ionian Coast. It was built on a Greek settlement founded in 734 BC by the Corinthians. Ortigia (Ortegia) is the location to see amazing ancient sights and the medieval city’s historical centre. Take a trip to the Temple of Minerva, Teminite Hill which is an archaeological park near Viale Teracati and the Via G. Emanuele Rizzo. The Temple of Apollo or Artemis is also another must-see to visit, an important part of the Greek world. Leaving Siracusa early in the morning, it takes around 4.9 hours to sail up the east coast to Taormina situated high up in the cliffs. Dropping anchor just off the island spend the afternoon in Taormina, a pretty town built on terraces that cascade down to the sea. Many guests like to take a walking tour. Pass by beautiful boutiques, do a little shopping, or have a coffee in one of the outdoor cafes en route to the Greek Theatre. See Mount Etna rising in the distance which creates a spectacular backdrop. Why not explore Etna if you have the energy while the rest of your party enjoy the cobblestone piazzas in Taormina? Try a Sicilian meal in a restaurant in town or alternatively dine on board your yacht. Chat about the day’s adventures and relax with a cocktail under the stars. The end of a perfect day. After sailing for approximately 6.36 hours from Taormina, the Lipari Group of Islands is next on the yacht charter itinerary. Rising from the Tyrrhenian Sea, these islands are absolutely magnificent. Spend the day cruising round the Aeolian Islands, the largest in this area. Have fun in the sun enjoying water sports or visit Vulcano to see amazing lava formations. A trip ashore via a tender gives you the chance to spend the day leisurely meandering through the many narrow streets of Lipari. Back on board your next stop is Palermo, about 7.5 hours away. The architecture in Palermo is striking and eclectic. This interesting Sicilian capital and port has been the seat of power for many different cultures which have certainly left their mark. While here do go and see the St Francis of Assisi church. This was built between 1255 and 1277 and is a medieval incarnation of distinct church architecture. The Ruins of Solunto are located outside the city of Palermo. These are the oldest Phoenician settlements on the island. The type of food here underwent a change with each culture that came and went, it’s absolutely delicious. Local dishes are worth trying as well as the pizza. Sfincione is the local pizza dish which doesn’t contain cheese and has different toppings to American pizza. Early the next morning cruise for about 3.5 hours from Palermo to Ustica. Ustica is a small island only 9 km across. There’s a ferry service from the island to Palermo. In Faraglioni, the major town in Ustica, while excavations were going on in 1989, a prehistoric village from the 13th century BC was found. Foundations of 300 stone built houses were unearthed with defensive walls of the settlement. There are about 1,330 people living here today with the main industry being scuba diving. The island’s volcanic geology provides a great underwater experience. Relax, do a little exploring or try the water sports for a fantastic day. 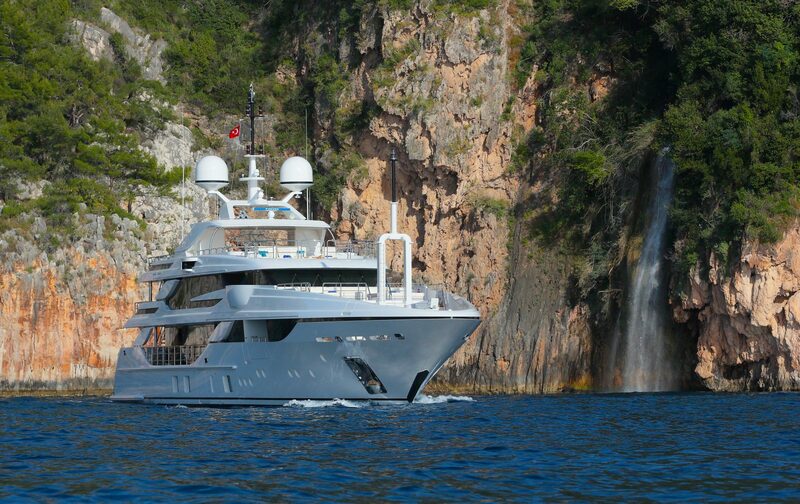 During the night, your superyacht will sail to more of the Lipari Islands taking 8 hours. Waking up you will find you have arrived at the southernmost end of Italy. Passing Stromblili, otherwise known as the Black Giant, take in the views of the constantly active volcano and the sea. Spend the afternoon in a quiet bay near the island of Lipari and do some sunbathing. Why not sail to Panarea which is the smallest island on the archipelago and have a mud bath created from natural springs? Over two days you can explore, dine, drink and be overawed with the sights of the Mediterranean. Next stop is Positano, about 11.5 hours away. This gorgeous town is also known as “the Gem of the Divine Coast of Amalfi” and rightly so. It’s definitely the highlight of a cruise and located at the foot of Monti Lattari or the Milkmen Mountains as they are known. Take a look at the town from your yacht which rises vertically above you. Chill out doing a little shopping, take to the water or just sit on deck under the wonderful sun. Be whisked away to the exotic Isle of Capri which is only an hour’s sail from Positano. Capri is full of natural beauty especially in the Bay of Naples. Enjoy a quiet afternoon cruising along the coast to reach parts of the island that are inaccessible by other means. Discover the natural Arch, the Faraglioni rocks, the Bay of Marina Piccola and the amazing Grotto Bianca. Sad to say your yacht will cruise to Naples where a plane is on standby to take you home. Don’t be too sad, there’s always the opportunity to do it all again next year!